I made Chicken Parmesan from scratch, woot woot! This recipe uses my Italian Breadcrumbs and Tomato Sauce recipes. 1. Coat chicken breast first in the egg and then in the breadcrumbs. Place on baking sheet and cook @ 350º for about 40minutes, or until juices run clear, or internal temp. reaches 165º. 2. 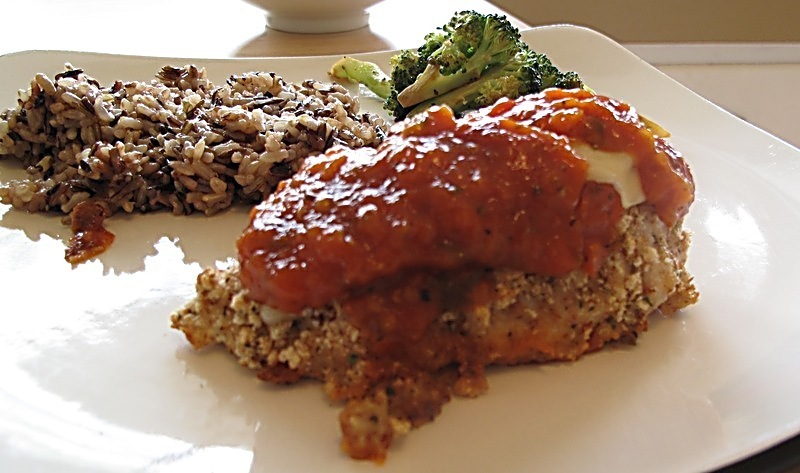 Brush baking dish with light layer of tomato sauce and place chicken breasts on it. On top of each breast sprinkle parmesan cheese, pour tomato sauce, place a mozza slice, and pour a bit more sauce over that. Put back in oven and bake for about 10 minutes, or until cheese is melted. This entry was posted in Chicken, Mains and tagged chicken, from scratch, main, parmesan, Recipes, tomato sauce by Karina. Bookmark the permalink.